Rodney McLeod is a legitimate NFL starting safety, but should the Eagles expect more? In our weekly Eagles chat on Wednesday, there were a lot of questions that we could not get to in time or other questions we did answer but could use more color. And so, we published a mailbag post to answer some of the overflow on Thursday. Here's another one. Question from Hugh the King: I’m not a fan of Rodney McLeod. Any chance one of the Eagles’ corners get a shot at safety? McLeod makes a lot of money. McLeod is a legitimate NFL starting safety who turns 28 in June. While he had a few questionable moments at the tail end of 2016, and his production was down in 2017 (only 54 tackles), he’s a hell of a lot better than the “Ghosts of Past Eagles Safeties,” such as Nate Allen, Jarrad Page, and Kurt Coleman (Eagles version). I think some of the frustration with McLeod is over the top, though for what he is making, he would ideally make more impact plays than he does. However you feel about him, McLeod isn't going anywhere. In 2018, if the Eagles were to release him, he would count for $9,218,750 in dead money. It would actually cost the Eagles more to release him than keep him. If they were to trade him, he would cost $7,218,750 in dead money, with a savings of just $1,187,500. 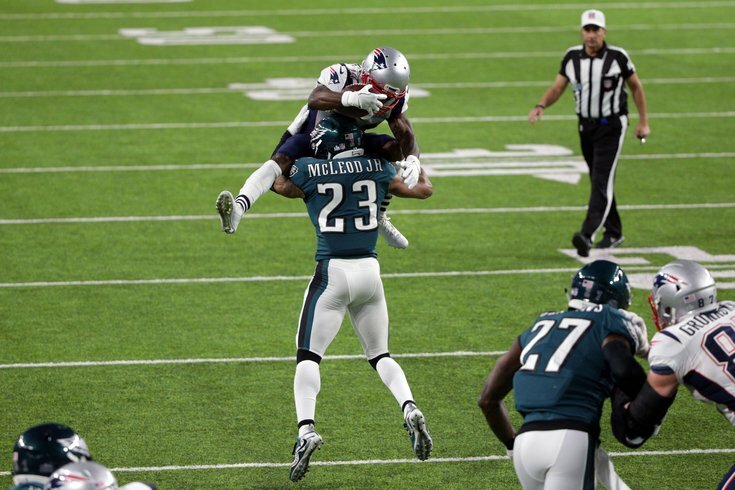 If McLeod doesn’t have a good year in 2018, the Eagles could conceivably get out of their deal with him, with a moderate amount of pain. If they released or traded him, he would cost $4,812,500 in dead money, with a savings of $5,093,750. That will become a much more realistic scenario if the Eagles take a safety in the 2018 NFL Draft, which feels likely. Question from Mike: Would you agree that adding another safety (that can play defense and not just special teams) is an absolute necessity this offseason? Or do the Eagles like some young guys on the roster that I’m not aware of? The only reserve safety on the roster other than Chris Maragos is Tre Sullivan, the guy that laid out the Packers receiver in the preseason last year. Remember this? Sullivan was on the Eagles’ practice squad this season. I don’t think the Eagles are counting on him, so yes, I would agree that they need more depth at safety. If they don’t draft one reasonably high, I think they’ll look to add Corey Graham to the roster once again, if he’s still available. Question from WMadden: Do you think it’s more likely the Eagles sign WRs and/or RBs in free agency, or address those positions in the draft? Well, we have the answer on the wide receiver position with the signing of Mike Wallace, which I think is a steal, by the way. I don’t think they’ll draft a wide receiver now, unless he is a guy the Eagles think can also be a quality returner from Day 1. I do think they’ll draft a running back. It’s another very strong class. I do not expect them to sign a running back in free agency. Question from Donnie’s Right Foot: Can the Eagles trade back into the second round and still nab Sony Michel, Derrius Guice, or Nick Chubb? Who do you prefer? Obviously Saquon Barkley is the No. 1 running back in this draft. After him, I would go Guice, Michel, and Ronald Jones as my next three, in that order. If the Eagles like one of those three guys a lot, I would not trade back and chance that they will still be there in the second round. In my opinion, Chubb is in the next tier, because he’s not much of a weapon in the passing game. If they like him, they could trade back and still possibly land him. I would not take Chubb at pick No. 32. Question from Hotboy: Is KR/PR a sneaky big need? Where do you see the Eagles addressing this need? I do think it’s a big need, Hotboy. If the season began today, who would the returners be? Corey Clement and Wendell Smallwood as the KR, and Donnel Pumphrey as the PR? That’s not ideal. I think they’d love to find a guy in the draft with ability both as a returner, as well as someone they can develop at a skill position, whether that be at WR, RB, or slot CB. Question from FredSanford: Do you think Ian Rapoport’s stupid Vinny Curry tweet killed his trade market? It didn’t help, but I don’t think there was any mystery that the Eagles weren’t going to keep him at his current contract. Question from Ken: This draft seems to be deep at guard. Could you see the Eagles drafting a guard at 32? I’ve seen guards mocked to the Eagles, and I don’t understand it. They have a Pro Bowl guard in Brandon Brooks at RG, a really solid starter in Stefen Wisniewski at LG, a reserve OG/C in Isaac Seumalo who the team is not going to suddenly give up on after a rough season, and a guy they like in Chance Warmack. If they were to draft a guard, it would be hard to keep Brooks, Wis, Jason Kelce, Seumalo, Warmack, the first round guard, as well as Jason Peters, Lane Johnson, and Halapoulivaati Vaitai. That’s nine. They can’t keep nine offensive linemen, in my view. Something would have to give, and I just don’t see it. Question from Will: There was a push from Jeffrey Lurie Last offseason to petition the NFL to bring back throwback uniforms, specifically the kelly green ones. Are you hearing anything this offseason about it? The issue is that the NFL doesn’t want teams to change their helmet color during the week, which would necessitate players having to be fit for new helmets. Apparently, the NFL thinks that causes some sort of elevated risk of concussions, which is absurd. Anyway, the Eagles (rightfully) don’t want to wear kelly green jerseys with midnight green helmets, because that would look dumb. Lurie is going to talk at the owners’ meetings this week. I’ll ask him if there’s any progress on that. Comment from LostInChiTown: Here’s a fun draft nugget for you: The Eagles gave the Browns a 3rd round pick in the trade for Carson Wentz. The Browns traded that pick to Carolina. The Panthers used that pick on Daryl Worley, who is now an Eagle. So in a way, the Eagles recouped their 3rd round pick two years later by trading for Torrey Smith.